As this post is being published, I , along with my sister, Julie, should be in Cambridge, Massachusetts helping college sophomore, Miss G. move into her dorm, Lowell House. At Harvard, students are randomly sorted into one of twelve residential houses the spring of their freshman year. They then stay in their assigned “house” for the next three years. Lowell has over 500 people living in it; 400 students and the rest are faculty, scholars and tutors. They sleep there, they eat there, they are advised there…This may be my favorite part of her college. I love that she’ll be part of a community for three years and will (hopefully, fingers crossed) make friendships to last a lifetime. Each house has a resident dean who supervises the undergrads’ academic and personal well-being. Each house also has a senior faculty Master who rules over the house; Miss G. is lucky in that her house has two, and every Thursday at 5 o’clock they have a Tea in their residence for the students. How cool is that? While we’re there, we’re going to check in on my nephew, Chase, an incoming freshman at Boston College and I personally am going to try to eat as many lobster rolls as I possibly can in three days. So, in honor of our Cambridge journey I thought I’d share a banana bread recipe that Mr. D. discovered. It comes from Chef Joanne Chang of the very yummy Flour Bakery (which I happily visited on my last Boston sojourn). 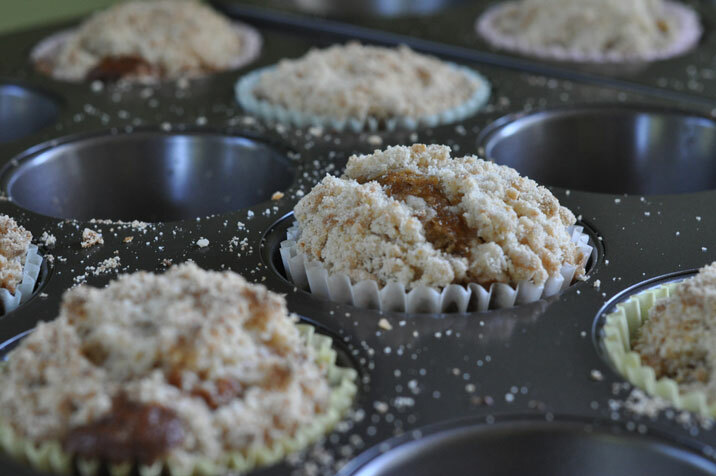 Mr. D. turned the bread into muffins and put on a crumb topping (1 cup flour, 1 cup brown sugar, & an 8 oz package of cream cheese since we were out of butter). I wonder if Miss G. will get banana bread as good as this at those Masters’ Teas? Sift (you know I do not sift, I mix) together the flour, baking soda, cinnamon and salt. Beat sugar and eggs with a whisk until light and fluffy (about 10 minutes - okay, you know I am going to use the kitchen aid). Drizzle in oil and add the bananas, creme fraiche and vanilla. Fold in dry ingredients and walnuts. Pour into a parchment lined (on the bottom) loaf pan and bake at 350 degrees for 45 minutes to 1 hour.